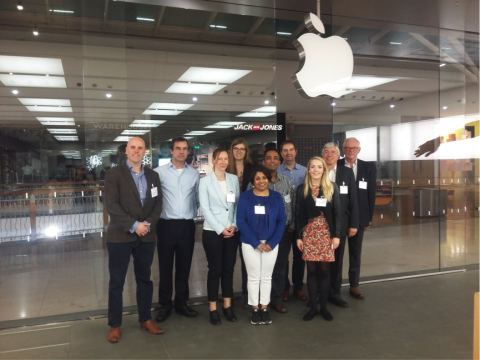 Tech start-ups and entrepreneurs from the south were put through their paces during practice pitches at Apple in Basingstoke yesterday (26 April). The pitching event, which is a collaboration between global number one business incubator SETsquared and tech giant Apple, aimed to get businesses ready to present to international corporates and investors next month, at SETsquared’s Open Innovation Showcase. Seven entrepreneurs, who are developing technologies for industries ranging from healthcare to green energy, to equestrian, delivered five-minute pitches to an audience of mentors, investors and Apple staff, and received feedback and advice to help them shape their offerings. Two of the companies, Onkho and Screenlimit Ltd, are part of the University of Surrey’s led ERDF Digital Business Acceleration Hub programme, which is supporting the growth of digital tech businesses in the EM3 Local Economic Partnership region. Start-ups can get help to develop their business models and raise funds through a two-day entrepreneurship programme and incubation membership. SETsquared, the enterprise partnership between the universities of Bath, Bristol, Exeter, Southampton and Surrey and global number one university business incubator, organised the practice pitches to allow each entrepreneur to try out their presentation and get on the path to innovation success. The Open Innovation Showcase, which will take place in London on 25 May, will see the start-ups pitch to 150 angel and institutional investors, corporate investors, CTOs and collaboration managers from international organisations, with previous events attended by the likes of Dyson, Sony and Airbus. The showcase will provide corporate delegates with the opportunity to understand how the developing technologies could feed into their own products and services, increase speed to market with new innovations, or streamline internal processes and systems. Simon Bond, innovation director at SETsquared, said: “The pitch practice sessions provide a vital opportunity for our entrepreneurs to learn where they need to improve, by going through the process in front of a friendly audience. The feedback and advice offered by the mentors, investors and staff was very well-received by the entrepreneurs, and will help each of them shape their pitches and build up their confidence to deliver them to a room of corporate investors – which could lead to their biggest business success so far.